Native to China, Korea, and Japan, Ulmus parvifolia, commonly known as Chinese Elm or lacebark elm, is a deciduous tree that has a rounded crown. It is noted for its elliptic, toothed, glossy, dark gree leaves, mottled bark and resistance to Dutch Elm disease. Small reddish flowers in late summer. Seeds in fall. 'Seiju' is a dwarf cultivar that is primarily used for rock gardens and bonsai. It is a sort of Ulmus Parvifolia 'Hokkaido that features slightly larger leaves and a faster growth rate. Over time it may reach 10' tall if not potted. Bark becomes corky with age. 9 years old, 13"-15" tall. 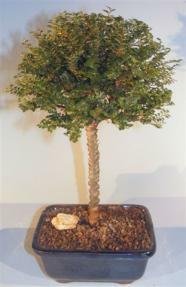 Outdoor bonsai tree, grown and trained by Bonsai Boy in the upright ball style.